It's interesting to see which breeds of horses were widely known in past times. Looking at show programs or books about horse breeds from past decades (or centuries) reveals which breeds were popular or recognized then, and it's often quite different from today. The map pictured was issued in 1934. Jesse and her Kiger Mustang, Fox, caught my eye at a dressage schooling show today. Fox was wearing this awesome custom leather halter. Jessie said she got it from Hell Creek Custom Leather. Isn't he adorable? They did a nice dressage test, too. ETA: I discovered later that Jesse does some very cute horse-themed metalwork. You can see some of her art and how she makes it on her flickr photostream. 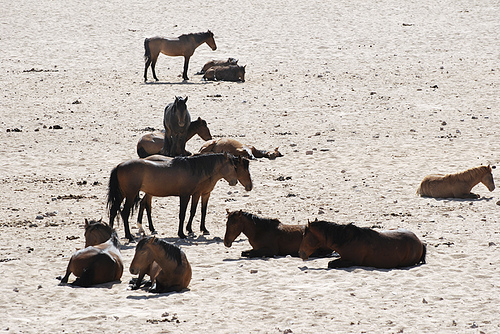 This photo is part of a photo set of a herd of feral horses in Namibia. The set provides an interesting look at daily wild horse behavior, from sparring to napping. Here a few horses keep watch while others rest. Follow the flickr link to enjoy more pictures of these horses. This article, though it dates from 1999, has some interesting info about the horses. Though I am unaware of their origins, the feral horses of Namibia have become a tourist attraction, and their population is sometimes stricken by drought, as was the case in 1999, when a controversial effort was made to save them. The feral horses were featured in a fictional film called "Running Free ", by Jean-Jacques Arnaud (director of "Seven Years in Tibet" and "Name of the Rose"), which has contributed to their popularity with visitors. The film is a classic horse and boy story of a stranded and suffering steed and the stable boy who loves him, who flee their cruel master to face the freedom of the desert. I haven't seen it, but will write a review if I do. The Waler is a scarce breed originating in Australia, where it was bred as a fine cavalry and stock horse during the era of the British Empire. Walers were highly regarded for their stamina, hardiness, agility, trainability and bravery in battle. By the 1940s the cavalry breeding program had been abandoned, and most remaining Walers were turned loose, becoming feral horses, while others went on to develop into the modern Australian Stock Horse. In the mid 1980s a move was made to round up surviving feral Walers, which were at risk of being shot or sent to slaughter as part of a government eradication program. The Waler Horse Society of Australia was formed at that time, and has been active in promoting this hardy, athletic breed as a sport horse. The Waler has an interesting background, being strongly influenced by the Indonesian Timor Pony and the South African Cape Horse, with much additional mixture of European coach and trotting horse breeds, draft horses, Thoroughbred, and Arab. The original Waler was not bred according to fixed standards, but rather by type; today it continues to be quite variable in appearance. However, the new organization takes into account the current preference for purebred horses, and requires registration and breeding records to be kept. Yarramalong Waler Stud has a wesbite full of photos showing historic and modern Walers in all sorts of activities. Also interesting is this page which quotes from dozens of historic sources, revealing the varied breeding programs and types of horse used by the military. They are affiliated with another association, the Waler Horse Owners & Breeders Association, which has broken away from the Society mentioned above, with somewhat different breeding guidelines and goals. Dr. Sponenberg, a professor at Virginia Tech University, is an influential expert in the genetics of domestic animals. He is well known for his studies of the genetics of coat color, and has also worked extensively on the identification and preservation of the Colonial Spanish Horse in the United States. The Colonial Spanish Horse is a horse descended from the Iberian horses brought to the New World by the Spanish and Portuguese, unadulterated by more recent mixing with draft horses, Thoroughbreds, Arabians, Quarter Horses or other breeds. Colonial Spanish Horses - and there are several dozen sub-types or breeds, based in various regions of the USA where they survived - are visually identified by specific conformation and show distinctive DNA markers in common with Iberian horses, such as the Andalusian and Sorraia. GHC: At what point in your life did you develop an interest in horses? Dr. Sponenberg: [I] became interested in horses pretty young, but didn't grow up riding or anything like that. Was always just interested in why they looked like they did, and why they did like they did. GHC: When did you first become aware of the Colonial Spanish Horse? Dr. Sponenberg: I became aware of Colonial Spanish horses in about 1971, after reading Hope Ryden's "America's Last Wild Horses." I also visited with Leanna and Buddy Rideout, and through them became acquainted with the Spanish Mustang Registry. From there things snowballed to the present! GHC: Do you think the awareness of CSH and the efforts of the ALBC to conserve the CSH have been effective? Dr. Sponenberg: I think we can claim modest success. The frustration for me is that in South America the Colonial Spanish horse is what people think of when they think "horse," while up here this is not the case. These remain outside the mainstream of horses and horse use, which is frustrating to me. GHC: Has the increased attention to conserving the CSH had any negative effects (such as breeders promoting horses as CSH that don't really fit the criteria...)? Dr. Sponenberg: I am not sure on this one. I do think that folks need to think "type" when picking matings and future directions. This cannot be stressed enough, as it is possible to drift from a good type pretty quickly. GHC: The US has a bit of a "free-for-all" going with registries. Besides the Spanish Mustang Registry there are broad registries like the Horse of the Americas registry, and very specific registries like the Steens Kiger registry. Does it matter that some breeders are mixing lines, some are isolating lines? Is it more important to preserve the CSH in general, or is it vital to maintain the specific sub-types? Dr. Sponenberg: I think there are some 20 registries at this point. [They] do serve to keep the strains out there as pure entities, which has some advantages. That said, the umbrella registries serve well to keep strains as well as the composite. I do think in general that joining together would make most sense. GHC: I have not seen anyone address the socio-economic side of the CSH. My impression has been that the CSH has survived in rural and poor areas, because the wealthy were able to "improve" their horses with Thoroughbreds and other European imports, which were high-status horses. Any thoughts on this socio-economic element in the conservation of the CSH in the US? Dr. Sponenberg: Well, this sort of situation is likely to persist unless and until these CS horses become synonymous with "really good and highly desired horse" in lots of people's minds. This is the challenge. I think we are making some progress, though. GHC: If funding were no object, what specific projects would you love to undertake (or see others undertake) to promote the CSH? Dr. Sponenberg: Promotion is tricky. The best would be horses being used and being successful. GHC: I do have to add, when I rode in Costa Rica recently I was completely sold on the Criollo horses. Dr. Sponenberg: I hope that the Central American countries get together to save their Criollo horses - not a whole lot has been done there yet! Many thanks to Dr. Sponenberg for taking time from his busy schedule to answer my questions. For more about Colonial Spanish Horses, see this post. So what are Colonial Spanish Horses? There are dozens of types and strains, and dozens of websites with conflicting or confusing information. Here is a handy summary, using on this article by Dr. Phil Sponenberg as a starting point for my own additional research. The Marsh Tacky is a rare breed of horse found in the southern US, specifically in the swamps of South Carolina and Georgia. Like the Florida Cracker, Chickasaw, and a few other southern US breeds, the Marsh Tacky is of Spanish Colonial type. This means it is predominantly descended from the horses brought by Spanish settlers to the southeastern US. Through the 1700s the southern US was culturally much closer to the Caribbean than to the English northeast. Most of the old southern breeds of horses, including the Mustang, are heavily influenced by the original Spanish stock, and their appearance and gaits show similarity to the Pasos of the Caribbean and Latin America. During the 1800s Thoroughbred & Arabian imports became a popular influence across the US, contributing to the more recent and still-popular breeds such as the Saddlebred and Morgan. The old Spanish type of horses survived in remote rural areas, where they were much-appreciated work and pleasure horses. Having no particular use in the show ring, they have tended to be little known outside of their place of origin. Although still treasured by hunters and others who ride in the back country, where the Marsh Tacky's surefootedness, good sense, and courage is appreciated, the breed is so rare it is in danger of extinction: there are only about 100 Marsh Tackies left. The Carolina Marsh Tacky Outfitters have an excellent description of the horses and their history, and the site has beautiful photos of these rare and unique horses. The American Livestock Breeds Conservancy is involved in studying the Marsh Tacky, and helping develop strategies for preserving it. ETA: Here is another useful article about the Marsh Tacky. The UK has done a good job of promoting and protecting the diverse Mountain and Moorland breeds - regional ponies of ancient lineage from the various parts of Great Britain. One of the least changed of these (i.e. 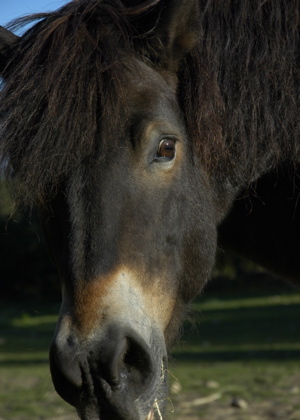 not having had much Arab or other breeds mixed with it over time) is the Exmoor pony. Many still live a semi-wild life. The stallion "Barton" pictured here shows the distinctive oatmeal colored muzzle, ridged eye socket, mealy color around eye, small ears, and dense coat characteristic of the Exmoor. These hardy ponies are good jumpers and can carry a small adult easily, even though they are typically around 12 hands high. They vary in color from dark brown like this one, to a more ruddy bay color. Most Exmoors have the mealy color not only around the muzzle but also on the flanks and belly. White marking such as socks and stars are not permitted by the registry, and rarely occur.